If NASA faked the moon landings, does the agency have any credibility at all? Was the Space Shuttle program also a hoax? Is the International Space Station another one? Do not dismiss these hypotheses offhand. Check out our wider NASA research and make up your own mind about it all. 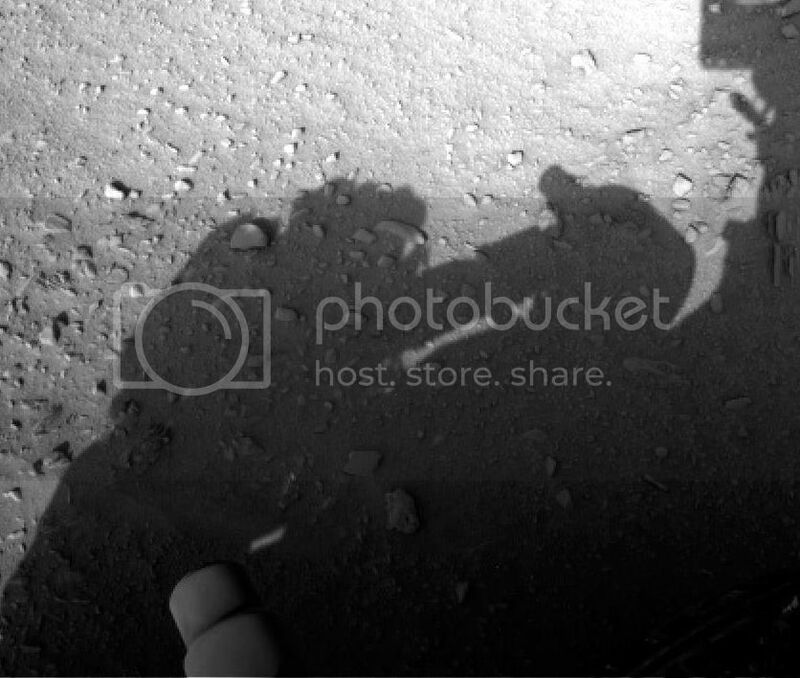 It looks like the shadow of a man leaning over the rover complete with hair on his head. Some of the alt media sites have latched onto this image and are, of course, claiming that it's a Martian that NASA is covering up. Question is: Is it really a goof on NASA's part or just more of their conspiracy candy? CitronBleu wrote: The participants in the review board are discussing the believability of the project. This is the word they used. CitronBleu - this is really good work on your part to get this much information and to look at it closely. When I read this it confirmed my initial suspicion in that it was just NASA's "wishful" thinking that they covered all eventualities WITHOUT actually physically testing a similar setup on Earth. To just simulate and then fly off into space is simply NUTS. If Mobius was giving them problems without anything dangling below it then I just find it very hard to take on faith that Curiousity would be less trouble. SANTA ANA, CA–(Business Wire – August 17th, 2012) – MSC Software Corporation today announced that its Adams multibody dynamics software played a crucial role in enabling the extraordinary descent and landing of the Curiosity Rover onto Mars on Sunday evening (August 5th). A team of engineers at the NASA Jet Propulsion Laboratory (JPL) performed a series of critical computer simulations of the sky crane maneuver sequences. In graceful fashion, the JPL team successfully and precisely placed the rover onto the Red Planet, in what many are calling an “immense technical achievement. Now you would think that it would be a company with YEARS of experience in working on complex machinery in the AEROSPACE Industry. Well one would think, but reality is different. Their customer list is extremely short and it is 2016 !!! At an altitude of 1.1 miles and a velocity of 220 mph, the Curiosity rover and its descent stage will literally drop out of the bottom of the aeroshell. And this leads in nicely to this interesting aspect. So what is the Martian Atmosphere really like ? 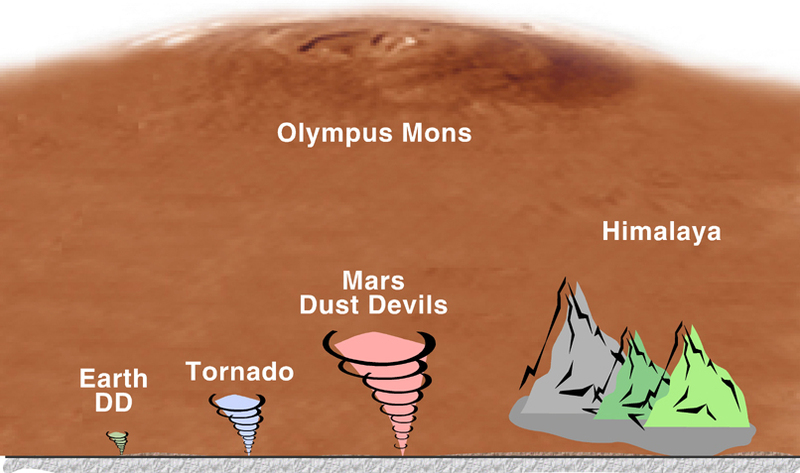 Some people are finding holes in the NASA data and the issue of Martian Dust Devils is a perfect example (besides the colors issue) of this. Wind means pressure changes. Are they measured by all the probes on the surface ? Apparently NASA data does not show conditions which would generate such funnels of fine dust !!! Here is a radio program where the father of the young guy who did this work discusses the issues with the NASA data on Martian atmosphere. JPL recently celebrated "women in science" on February 11 and for the occasion took a group employee picture. This reminded me Simon of your excellent and very funny posts on NASA employee group pictures. I searched your posts but couldn't find them. From the JPL website : "In honor of the first-ever International Day of Women and Girls in Science -- designated by the United Nations to take place each February 11 -- more than 150 women working in science, technology, engineering and mathematics at NASA's Jet Propulsion Laboratory posed for a photo in mission control." Hilarious... for those interested here's Simons post on the NASA control room imagery. So...what's going on, folks? Are our longstanding, tireless efforts at exposing the TOTAL NASA FAKERY actually "paying off"? In any case, it's a heart-warming feeling. I will pop a special bottle of bubbly tonite - to celebrate this apparent (however marginal) success of our valiant, ongoing endeavors. You've gotta love the dramatic soundtrack. Those NASA clowns sure know their target audience: Hollywood action-movie addicts. Government “officials” can’t even sync traffic lights properly half the time. I have to agree with you Simon. Simple (cheap) “dramatic soundtracks” are all that is needed to cause a large portion of humanity to shut off critical parts of the brain that may otherwise detect the utter fiction. Wait, we still haven't had a single image ? Not even a small car in orbit ? Otherwise, "we" have already sent robots to Mars, what's the "novelty" here ? You've gotta love the dramatic soundtrack. Simon, and the dramatic celebrations, watch between the 5:00 minute and 6:40 minute mark if you don't want to waste too much time, where they just happen to have a close up camera on the couple next to the guy wearing the stupid hat and capture their elaborate hand celebrations on apparent touchdown.